The Boomsday Project, the second expansion in Hearthstone’s Year of the Raven, releases later today, but as ever with these releases, exactly when you’ll be able to play isn’t always clear. With that in mind, we’ve reached out to Blizzard to determine exactly when you’ll be able to open those fresh new packs. For the most part, Hearthstone expansions seem to release in the evening for Europe, either mid-morning or early afternoon for the US, depending on where you’re based, and The Boomsday Project appears to be no exception. A Blizzard representative stated that the new expansion will release at 18:00 BST this afternoon. That’s 13:00 Eastern Time, or around 10:00 Pacific Time. It is, of course, worth noting that Blizzard haven’t always got the new expansions out on the dot of their scheduled release times. With that in mind, if you’re particularly keen to get involved as soon as you can, you should be aware that there’s the potential for the new cards to drop a few minutes before or after that 18:00 deadline. Either way, by tonight, The Boomsday Project will be well underway. 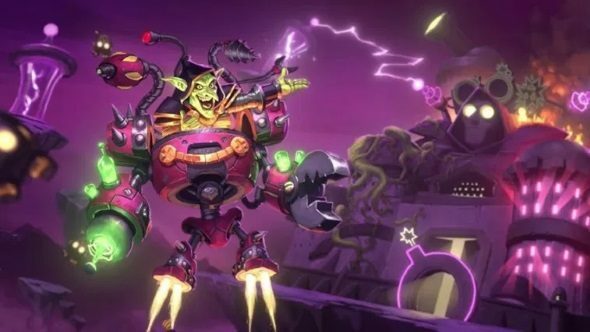 Before the expansion drops, you can take a look at all The Boomsday Project cards to help kickstart your theorycrafting – or just pick up Whizzbang the Wonderful and use one of his decks instead. Once you get in-game, you’ll have the new Magnetic effect to contend with, as well as new Project cards which benefit new players, and Omega Project cards which are at their most powerful when played at ten mana.